CRAZY DISCOUNT! Was: $329.95 Now: $239.98! A pool cover will lessen the costs of these factors by covering the pool. Save water by limiting evaporation to preserve the water in the pool. Lessen energy consumption by 50% with a solar blanket. Save chemicals thanks to the protection of the swimming pool covers, you will use less chlorine and save more money. Pool covers australia will save you more money by lessening the maintenance costs. With the Solar Swimming Pool Cover in place, it can help to keep your pool cleaner for longer as well as keep debris and other waste products from entering your pool. 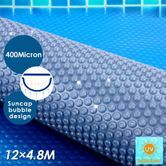 Size at 12.0 metres by 4.8 metres and specially treated to resist UV damage. Ultra light, easy to handle as well as being completely recyclable, this simple yet ingenious pool cover does it all! Don't delay and get yours before they are all gone! 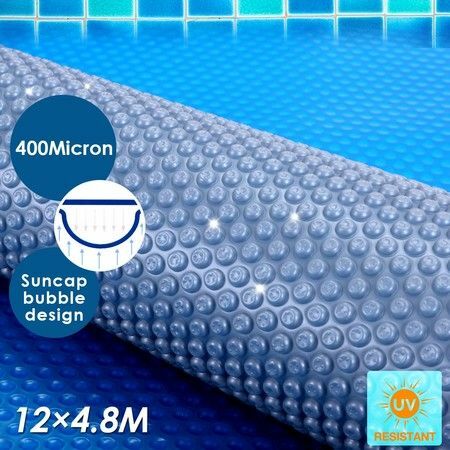 Using a swimming pool cover on an average sized pool (12M x 4.8M), up to 50% less chemicals are required. This equates to approx. 8kg of chlorine! Excellent communication and brilliant postage speed.